Attention: Co-ordinator of Primary and Early Learning Programs. I am forwarding a reprint of my recent article, of which an edited version was published in the current issue of Teacher. In 1971, with like-minded colleagues, I started a program devoted to play based and personalized learning for children aged 4-9 in a new Vancouver public school. The program continues to this day. Having made major changes in my approach to teaching and been rewarded by my students’ responses, I share my experiences by speaking, mentoring and writing. 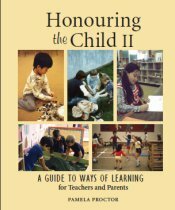 I wrote Honouring the Child – Changing Ways of Teaching and embarked on speaking tours to many communities in British Columbia. Through discussions with teachers and parents I became aware of a need for more succinct information and wrote a hand-book, Honouring the Child II – A Guide to Ways of Learning. My books have been published with assistance of my husband, John Roper, through our company, tmi Publications. While single copies are available, it is more economical for school districts or groups of teachers to order copies at a substantial saving directly from our company. Our quotation is enclosed. I invite you to visit or contact me at my website www.honouringthechild.com. New Book already in Schools Author/Consultant Pamela Proctor's new book was still being printed when it was ordered by Vancouver area schools to support their Reggio Emilia inspired personalized learning centres for young children. Her work to produce this new handbook of practical information started years ago. Following the release of her first book which has now sold close to a thousand copies, she traveled to over thirty communities in British Columbia to meet with teachers and parents. Through these interactions she became aware of a need for practical information on how to organize, facilitate, and enhance young children's personalized learning. In response to a perceived need, and her current involvement with Reggio Emilia inspired initiatives, she has produced this handbook using insights developed over 35 years experience in establishing innovative programs in the primary classrooms of several Vancouver Public Schools. Her new book is a 75-page companion to the original and is packed with practical information for teachers and parents to enhance young children's personalized learning. In Aril 2012, I was invited to visit York House which is a well-established private school for girls in Vancouver. I spent several hours there hosted by the assistant head, Kathy Kealey and Shellie Lammie, head of the Little School (Kindergarten) who, inspired by visits to Reggio Emilia and eight years ago, introduced Reggio practices in the Kindergarten/Primary program at York House. I felt very comfortable with what I saw and heard at York House because of my experience during sixteen years at Dickens Annex, a Vancouver public school, was similar. Even though it was lunch hour when I arrived, I saw that the children were open and relaxed and that they moved in a mature manner in the hallways. The demeanor of the children did indeed reflect the quality of the approach. The classrooms, which were organized in workshop style, were attractive and orderly. The Kindergarten children I observed were engaged and focused on their activities. For a city school, the garden in a small space behind the Little School was most impressive. Parents were partners in the program and besides supporting, offered their expertise to further enhance the children's learning. 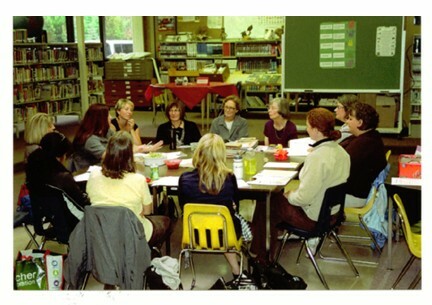 Kathy Kealey and Shellie Lammie are open to having visits from educators who are interested in the Reggio Emilia approach and I recommend the school as an example of what can be accomplished. On the eve of the pending "new" curriculum in B.C., based on personalized learning, could Coquitlam be pointing the way? In January 2012, my husband and I went as guests to a meeting there regarding the start-up of a program for primary inspired by Reggio Emilia. It was attended by about 100, including parents, teachers, trustees, the superintendent, someone from the Ministry of Education and guest speakers from Alberta. We were joined at a table by Dr. Laurie Kocher, professor from Douglas College, who lectures on the philosophy and who knew of me because a student had written a report on Honouring the Child. MC Maureen Dockendorf introduced people, and then talked about the importance of parents, the differences in children - the variety of programs offered in Coquitlam and that parents knew their children best and could choose. Sandra Trumper, Calgary principal of a large multi-cultural elementary school featuring Reggio inspired programs spoke first while images of children's work were shown on the screen behind her. There are eight Reggio inspired schools in Calgary. Barbara Bannon, principal of Olympic Heights School in Edmonton was passionate about Reggio Emilia. She shared pictures of children at work in a Kindergarten class. After the presentations, we shared our impressions with others near us. Then Maureen invited questions from the floor, some of which I could have anticipated, such as my child is autistic would he be accepted? (Yes, all children are accepted and it's our job as educators to work with them and with you in their best interests). How do you know they're learning? How do you report? What happens when they move on through the system?-are they ready to graduate? Lastly, Laurie Kocher announced that the Wonder of Learning: The Hundred Languages of Children Exhibit from Reggio Emilia would be coming to the New Westminster Quay (July until December) and that Dr. Katz would be speaking in Burnaby 4th of July, (Dr. Katz wrote a forward for my book.) The following is the web-site, which is constantly being revised www.wonderoflearningvancouver.com. And then surprise! One of the Coquitlam Directors of Education ordered 30 copies of my book and asked if I could I do a workshop later? What a breakthrough. It is such a joy to see that people already have the 'idea' and are willing to launch out this way. Over the past 2 weeks author Pamela Proctor spoke to over 100 parents and teachers at libraries, schools, and bookstores in northern B.C. communities. Starting with multiple events in Campbell River and Port McNeill, and after speaking in Port Hardy, she travelled on by BC Ferries to speak in Prince Rupert. From there she travelled Highway #16 through to Prince George, stopping to speak in Terrace, Kitimat, Smithers, Houston, Burns Lake and Fraser Lake. In her talk Proctor discussed the factors that are important for young children's learning. Also she described her own personal transition in teaching, from a traditional lock-step teach test rank and fail approach, to a more facilitative style that engages each child's talents and natural interest in learning. She described how children can master the basics more effectively with creative arts, co-operation, team work, and physical activity. Her talk stimulated lively discussions with interest heightened by the change in schools to all day kindergarten. There were also media interviews and sales of her book Honouring the Child have been boosted by this tour to over the 700 mark. The book is now available at Coho Books in Campbell River, Rainforest Books in Prince Rupert, Misty River Books in Terrace, Speedee Interior Stationary in Smithers, Country Wide Printing in Houston, and at Books & Company in Prince George.